What disease does Joseph Merrick have? 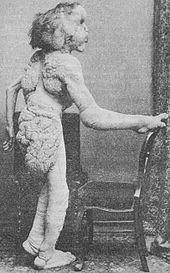 Joseph Carey Merrick, often incorrectly called John Merrick, confused with his younger brother, was an English man with severe deformities, was born on 5th August 1862, to Joseph Rockley Merrick and Mary Jane. Joseph Rockley was the son of a weaver. His family moved to Leicester during the 1820s or 1830s. Mary Jane (née Potterton) was the daughter of agricultural labor and had some form of physical disability. She married Joseph Rockley in 1861. The following year Joseph Carey was born, a healthy child with no outward symptoms of any disability for the first few years of his life. The Merricks had three more children, all of whom died at a very young age. The concept of maternal impression was still a common belief in 19th-century Britain. While Mary Jane was pregnant with Joseph Carey, she was knocked over by an elephant. The Merrick family explained the disabilities of Joseph Carey with that incident. Joseph, too, grew up with the same belief. Despite increasing deformities, Joseph Carey had a relatively normal childhood and attended school. He shared a close bond with his mother. Unfortunately, when he was 11 years old, his mother died from bronchopneumonia. His father married again. Joseph left school at the age of 13. He got no affection from his father or step-mother. He then found work at a factory of rolling cigars, which he had to leave after 3 years. Eventually, he managed to secure a hawker’s license and started to earn by selling items from the haberdashery shop, door to door. But due to his deformities, it was unsuccessful. His facial deformities left his speech unintelligible. He eventually had to give up and return home. His father shunned and beat him. Joseph Carey was now homeless and roamed on the streets of Leicester. His uncle, Charles Merrick, a barber, got him out off the streets and accommodated him in his house. He spent the next two years trying to find a livelihood in Leicester. Eventually, his uncle, too, couldn’t provide for him and in December 1879, Merrick entered the Leicester Union Workhouse. Joseph Carey concluded that he could earn his livelihood in the world of human novelty exhibitions. He wrote to Sam Torr, a comedian of Leicester Music Hall and its proprietor. Torr decided that in order to retain Joseph Carey’s novelty, he’d have to be a travelling exhibit. 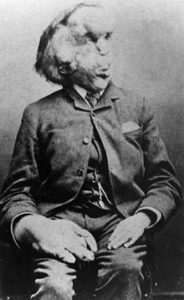 On 3rd August 1884, Joseph Carey left the Workhouse for good and began his career as the Elephant Man. The Elephant Man, “Half-a-Man and Half-an-Elephant”, was showed around the East Midlands. Joseph Carey then went to London, to be exhibited in the penny gaff shops in London’s East End exhibiting human curiosities. The Elephant Man exhibit was moderately successful. 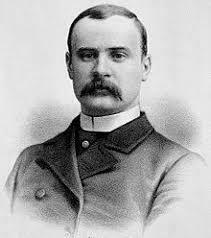 Frederick Treves, a surgeon at the London hospital, whose colleague, Reginald Tuckett told him about the Elephant Man, called Joseph. Treves persuaded Joseph to come to the hospital for examination. Joseph’s head circumference measured to be around 36 inches, his right wrist, 12 inches, and one of his fingers measured 5 inches in circumference. There were many bone deformities in his body. Although he did undergo corrective surgery to his mouth in 1882, his speech remained intelligible. Treves concluded that Joseph Carey was in good health. Victorian Britain, at this point, changed its taste regarding freak show exhibitions. The police closed the Elephant Man’s exhibition shop. In 1885, Joseph found himself on the road with Sam Roper’s travelling fair. Eventually, the freak shows were experiencing criticism. Joseph’s manager decided to send him to a tour in Continental Europe. In Brussels, Joseph Carey was abandoned by his new manager, who took all his savings of £50 (in today’s date equivalent to £5,500). He eventually returned to London, at Liverpool Street station but with nowhere to go. Treves came to his rescue and took him back to London Hospital. Treves observed that Joseph’s deformities had worsened. He also detected some heart conditions and that he only had a few years to live. On 4th December, the hospital’s chairman, Francis Carr Gomm, wrote a letter to The Times, outlining Joseph’s condition. The donations helped the hospital to allow Joseph to stay there for the remainder of his life. Joseph and Treves established a friendly relationship. Treves learned that, throughout his life, women shunned Joseph. The only opinions about women he had were either derived from his memories of his mother or from books. Treves requested his friend, Mrs Leila Maturin, a young and pretty widow, to meet Joseph. Joseph met many women during his time at the hospital. The letter in The Times drew the attention of London’s high society. Actress Madge Kendal helped raise a huge fund for him and used to send him signed photographs. Other ladies and gentlemen of the high society also used to visit him. On 21st May 1887, the hospital added two new buildings and the Prince and Princess of Wales were invited for the opening ceremony. The princess exhibited her desire to meet The Elephant Man. She presented him with a signed photograph of herself and sent him a Christmas card each year. Treves, with Kendal’s help, arranged for a visit to the theater for Joseph. They took him to attend the Christmas pantomime at the Theater Royal, Dury Lane. This experience left Joseph enthralled. For weeks, all he could talk about was the pantomime. Joseph’s condition worsened during the 4 years at the hospital. His facial deformities increased. He died on 11th April 1890. His death was ruled as an accident and the hospital certified that the cause was asphyxia, caused by the weight of his head as he lay down. The autopsy report stated that Joseph had died of a dislocated neck. 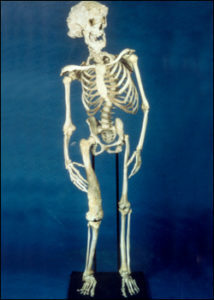 Treves later mounted his skeleton, which remains in the pathology collection at the Royal London Hospital. There is a museum which dedicates his life and houses some of his personal effects. Although the institution intends to keep his skeleton for educational purposes, some contend that as per Joseph’s beliefs, he should be given a Christian burial in his home city of Leicester.